Beware inconsistent styles and a sketchdump. Been practicing a lot lately. So I might not go the full 1,000 route just yet, but I will go for 100. It's a little bit more manageable and less intimidating, I think. The shapes are definitely starting to come to me a little easier, but I don't think I'm quite ready to start doing these from imagination yet, so as I wrote on the paper, these are copied. I'm having fun reading through the magazine as I sketch the figures, lol. So where have you run off to?! Come back and bang out some more of them figure drawing drills! haha I feel like I've been hit by many michaelangelo statue of david statues in your study. You acknowledge certain points in your study that show you're on your way if you stick at it more! Yeah I definitely need to adjust some proportions on my next pass at the character! The wind effects are actually supposed to be like "ice energy", it's meant to look and feel like ice in motion which I know is physically impossible but anime amirite. I'll have to do more research into how to make good and convincing particle effects, it's an entire thing of itself to try and do. Nothing's changed love your style as usual, maybe the proportions aren't even that bad - provided it's your style and you know how to replicate intentionally, I say it works pretty well! I love the tall 'lanky' figures closer to 8/9 head proportions e.g. Kubo's Bleach design, pleasing to the eye and reminiscent of the old renaissance classical styles! Love the piece good work as usual! Man it's such a subjective statement I know but traditional work like this really sells me. I just love the idea of it being real and there in your workspace after working on it. Until you have to find a place to put it, But seriously, you take it for granted when you do a lot of traditional work. I can tell I have a very different relationship with my own digital art. I wasn't even sure if I should include it in my own portfolio when applying to have the university review it. So many characters...so many...ugh, you're like me. All the OCs. Just about every stereotype and trope will get covered eventually if people like us aren't stopped. 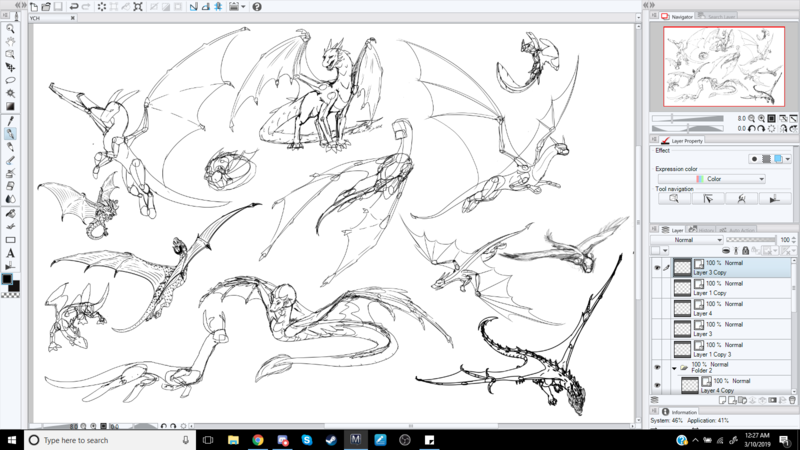 Yeah and I've been trying to go back and flesh out some of the characters I worked on a long time ago. 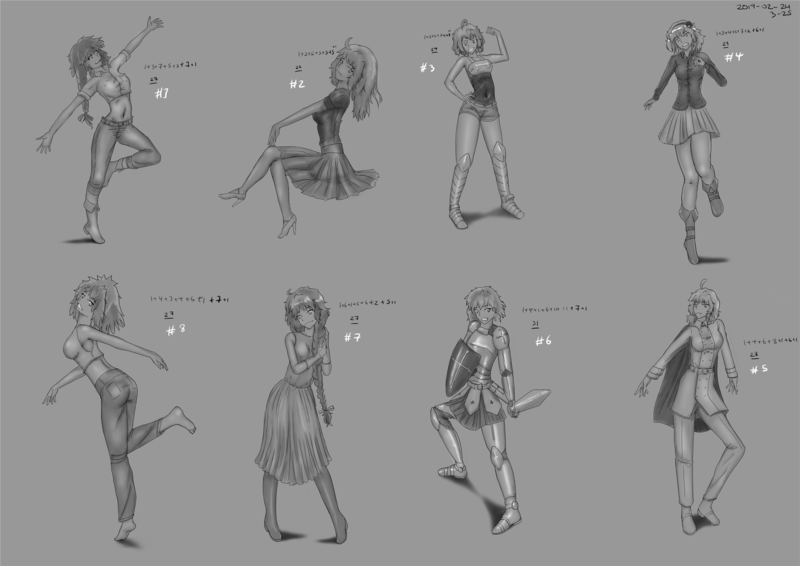 Most of the characters of Izabel have already existed, like Izabel herself, but with different identities. That was originally the goal with Blade Regalia, but then I ran out and had to create brand new ones. That's called forgery a cool idea. Not exactly incorrect. Contemporary artwork can have copyrights. I recently found out buildings can be copyrighted. Architecture and interior designs require permission to photograph if it's recognizable. The more I draw this piece, the more I come to hate Da Vinci for putting me through it. I love Izabel's design, very simple cute and creepy at all once. I'm curious about the game's story already just from the character designs! Great work with the assignment, you definitely captured Da Vinci really well imo. During some play testing I've successfully been able to terrify family members without using jump-scares or any audio. Huge win for me since it is my first time working with horror. And it's a bit challenging as I'm trying to avoid gore. Your skills are growing and your characters definitely become nicer to look at over time. One thing I could suggest is to do more "masterpiece" work. Drawings that you spend a large amount of time on. The fear of days of work going to waist because say for instance, on the 3rd day, you realized the eyes weren't symmetrical, will pressure you to setup your artwork more efficiently to make those kinds of errors impossible. That's a very good point, if one stays in practice (safe) mode one isn't obliged to stay sharp as the topic of study is what is prioritised; but finished pieces forces you to reconcile all of what you've learned (and to a presentable standard). That said he's come a long way and we are starting to see the fruits of his labour - for me in particular as I'm here sporadically it's nice to see where he's at now vs a month/2 months ago. 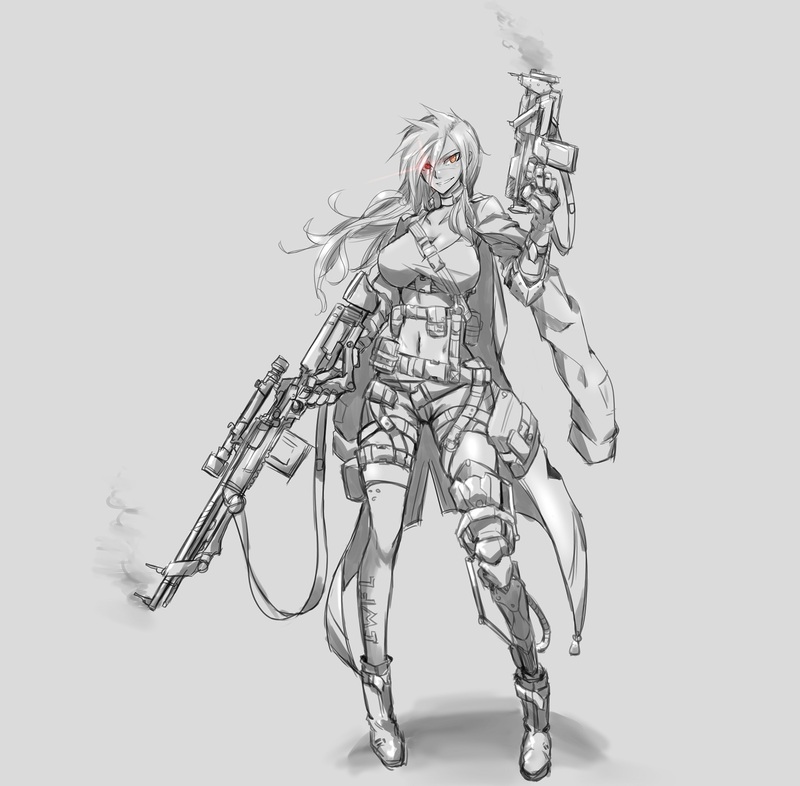 Just a small update, Sael's final concept sketch is done! 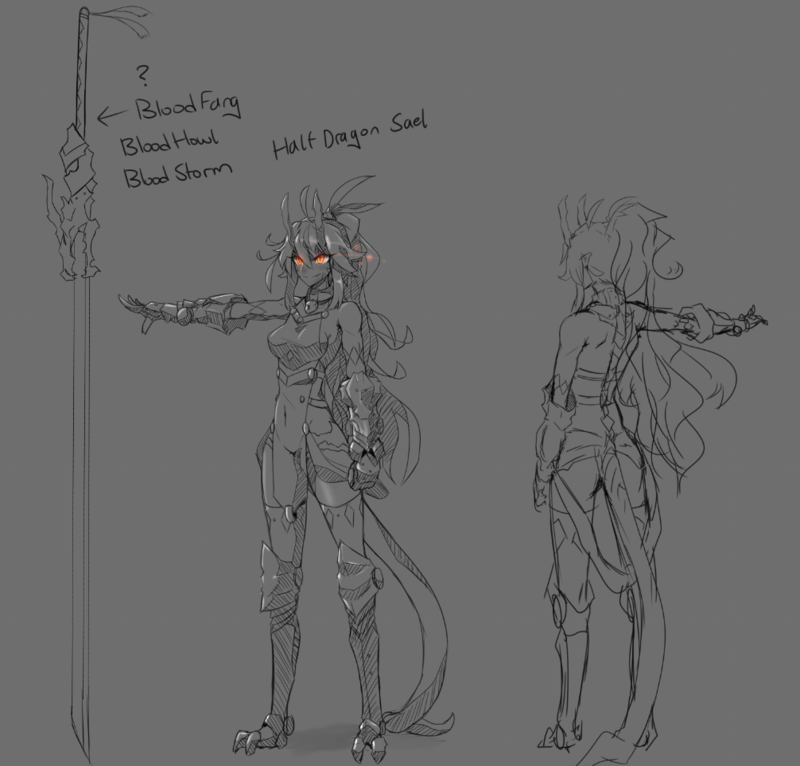 Here is the front/back, back is still a rough and I haven't figured out what to name her sword yet all I know is, it's gonna be real edgy haha. sick work as usual, Devola! Still got an edge to your style (and poses) that I envy to possess in my own work. Good details on garments too. I have never spent so long not knowing what I was doing, seriously. Took THREE AND A HALF hours, almost the exact same time for each piece. Just look at all those stacked numbers. That's how many stages I went though for each piece. Also I spent an hour beforehand copying a bunch of Devola's art to try and pick the style up. Probably if I did that a couple of times I might have gotten it down a bit better but had to balance my time. -First time IIRC properly trying to emulate someone's style. I noticed my own style habits kicking in all the time so the pieces were leaning towards my own style more than I wanted. -Got lots more respect for your skill now Devola although I had plenty before. -Like how do you shade even? I learnt a ton about shading and I've certainly got some ideas I want to try out now and trying to think outside my normal pieces was a good experience. I'll link back to your DA page Dev if that's alright. You got any snippets of the overdrive work? ?